We present the case of a 22-year-old man who presented with cough, haemoptysis and fever of 3 days’ duration. A teratoma had been diagnosed 2 years previously. Physical examination was unremarkable but laboratory tests showed anaemia, neutrophilic leucocytosis and an increase in C-reactive protein. Chest CT revealed a teratoma of the anterior mediastinum with post-obstructive pneumonitis suggestive of tumour rupture. Antibiotic treatment resulted in a good clinical outcome. The patient was submitted to a left upper lobectomy and pathological examination revealed a mature teratoma. Teratomas are germ cell tumours that are usually asymptomatic and their rupture is a rare event. Suster S, Moran C. Diagnostic pathology: thoracic. 2nd ed. Philadelphia: Elsevier; 2017, pp. 696–701. Hoang CD, Shrager JB. Anterior mediastinal masses. In: Sellke FW, del Nido PJ, Swanson SJ, editors. Sabiston & Spencer – Surgery of the chest. 9th ed. Philadelphia: Elsevier; 2016, pp. 711–723. Sharma R, Gadodia A, Kumar A, Madhusudhan K. Spontaneous rupture of benign mediastinal teratoma: a report of two cases. Indian J Med Paediatr Oncol 2012;33:123. Jothianandan K, Tibb AS, McLemore M, Keller S, Appel DW. 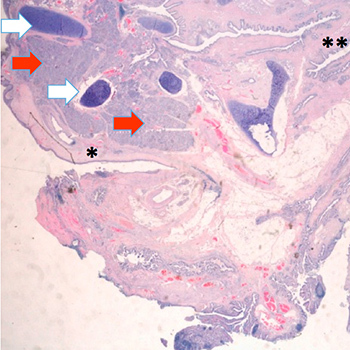 An adult man presenting with hemoptysis caused by mature teratoma with rupture into the bronchus and pericardium and complicated by Haemophilus influenzae infection. J Thorac Cardiovasc Surg 2010;139:e104–107. Sasaka K, Kurihara Y, Nakajima Y, Seto Y, Endo I, Ishikawa T, et al. Spontaneous rupture: a complication of benign mature teratomas of the mediastinum. Am J Roentgenol 1998;170:323–328.